Who do you think has gone that extra mile academically? Perhaps you know a lecturer, Personal Tutor, or Academic Rep that has inspired you or really gone out of their way to support you in your studies. If you think they deserve recognition, why not nominate them for an Academic Award. 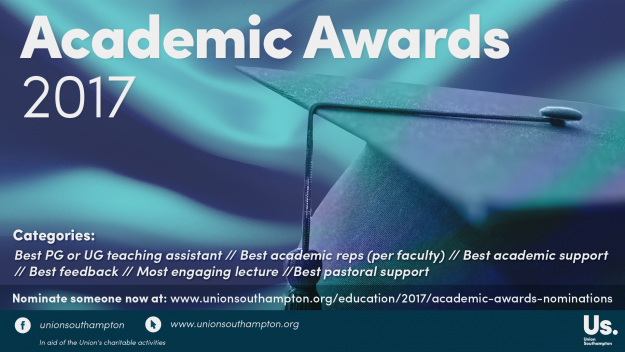 We’re hosting our annual invitation-only ceremony on Thursday 11 May at The Cube, where we will be wearing our best finery to celebrate the academic achievements of University staff and our Academic Reps.
You can nominate a deserving person before midnight on Wednesday 15 March to receive an award on the night by going to: www.unionsouthampton.org/education/2017/academic-awards-nominations. See who else is attending the night on our official Facebook event. The room set up for last year’s Academic Awards ceremony.